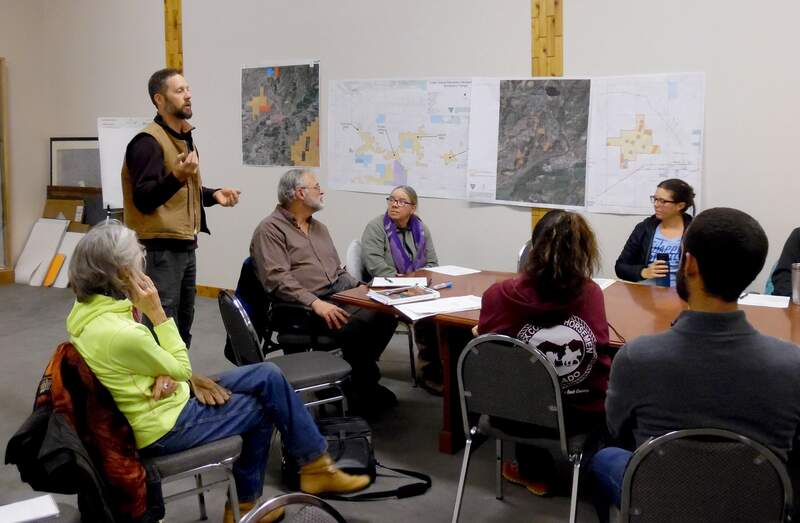 Bureau of Land Management recreation planner Jeff Christenson explains the process of proposing new, non-motorized trails to Mancos town officials. 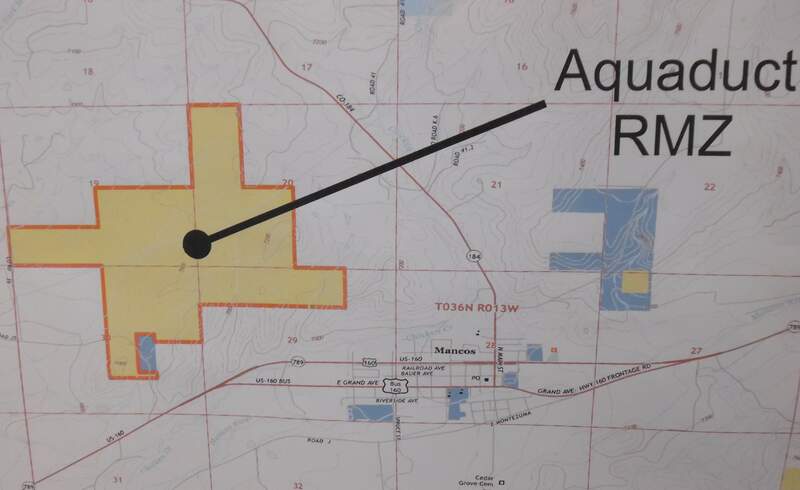 The Aqueduct area, 1,000 acres of Bureau of Land Management land northwest of Mancos, is being targeted for non-motorized trail development. Trails for the Aqueduct BLM parcel must avoid areas with sensitive resources indicated on this map. MANCOS – Recreation groups met with federal and local officials last week to push for biking, hiking and horseback trails on three Bureau of Land Management parcels along U.S. Highway 160 north of Mancos. The three undeveloped parcels – known as Chutes and Ladders, Summit and Aqueduct – are part of a BLM Recreation Management Area that are ideal for non-motorized trail development, BLM recreation planner Jeff Christenson told the group, which met Jan. 10 during a workshop in Mancos. The town of Mancos and the Mancos Trails Group are especially interested in developing non-motorized trails on the Aqueduct parcel, 1,000 acres northwest of town off of County Road 39. “It’s a great opportunity for the town and promotes outdoor recreation and healthy lifestyles,” said Mancos Town Administrator Andrea Phillips. Christenson emphasized that proposals would require an environmental analysis that includes archaeological, wildlife and ecological surveys to identify buffer zones and mitigate any potential impacts. “Once a trail proposal is submitted, it would be a one- to two-year process for approval,” he said. The trailhead and parking lot would be at the County Road 39 entrance to the Aqueduct parcel. The town owns a parcel of land there and uses it for yard waste. Spectacular viewsThe Aqueduct area is defined by two prominent ridges separated by a scenic valley. A historic ditch crosses the land on the eastern end. Hikers suggested that new trails could be developed in rugged and steep sections to help separate user groups and reduce conflicts. Christenson said the mountain bike travel for new loop trails would be directional, similar to how they are laid out at the Phil’s World trail network. Bike travel would be restricted to designated trails, but horses and hikers would be able to travel cross-country. Pets would be required to be under voice command. Tif Rodriguez of Back Country Horsemen advocated for more horse trails at the Aqueduct and Summit areas. Separate trails just for horses are not really necessary, she said, but more education and signage about how cyclists and hikers should act when encountering horses would be helpful. Equestrians also need adequate parking areas that have room for trailers, loading and unloading. All three areas would be subject to seasonal wildlife closures between December and April to protect winter habitat for mule deer, Christenson said. At Aqueduct, trail development must avoid a dozen areas that have sensitive resources. BLM seeks partnershipsThe BLM is advocating for partnerships with trail groups to become stewards of trail systems, said BLM staffer Dave Saunders. The idea is that with more eyes on the ground, there is less chance for looters, illegal dumping or unauthorized motorized use. Plus, trail groups provide volunteers for trail maintenance. “With formalized partnerships, the BLM is in a better position to contribute funding or tools,” Christenson said. Town officials and the trail group will begin more comprehensive tours of the area and have workshops to determine trail locations for a proposal to be submitted to the BLM by summer. Professional trail builder Emma Millar of Trails 2000 said she could provide expertise on good trail locations for hiking and mountain biking at the Aqueduct area. Chutes and Ladders and the Summit area also have potential for trail development, Christenson said. Chutes and Ladders is accessed off of County Road 34, north of Mesa Verde National Park. The Summit area, south of Summit Lake, has limited public access, which the BLM would like to improve, officials said. Trail recreation and development is surging in Montezuma County. The Boggy Draw trail system near Dolores and at Canyons of the Ancients National Monument has drawn regional and national acclaim. A plan to expand the popular Phil’s World trails near Cortez is waiting BLM approval and is expected soon. Paths to Mesa Verde, a proposed 17-mile non-motorized trail between Mancos and Cortez, is in the planning stages and made Colorado Gov. John Hickenlooper’s priority list for new trails. There’s also talk of connecting a trail from Cortez to Montrose as part of the Rimrocker Trail that connects to Moab, Utah. 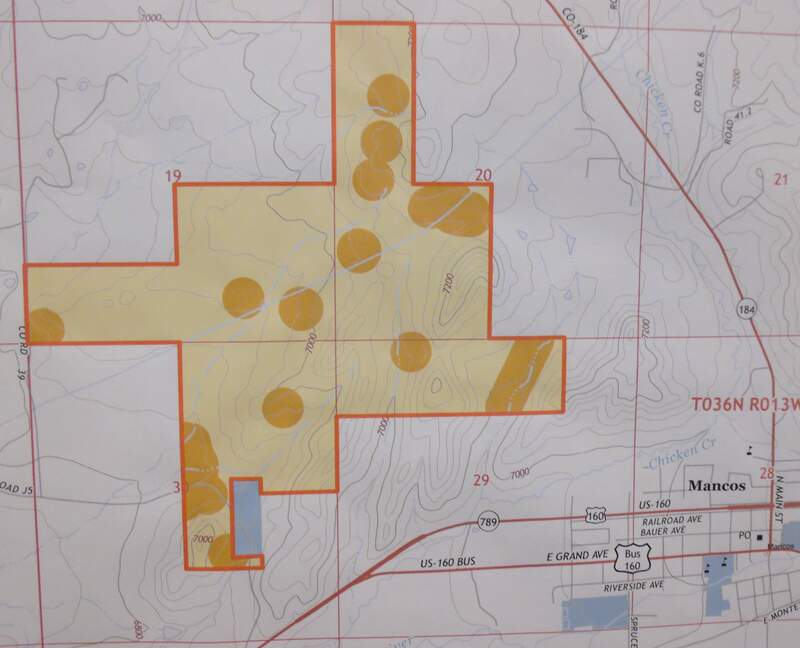 For three years, Montezuma County commissioners have advocated for trails as a way to diversify the economy heavy reliant on the carbon dioxide extractive industry, which has been declining and is expected to be tapped out in 30-50 years.